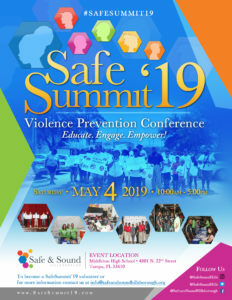 SafeSummit’19 is an annual one-day, community lead conference that brings together residents, employers, law enforcement officers, and community partners to discuss solutions to reduce violence. With an emphasis on educating and empowering our community, the action-centered day is filled with a series of engaging workshops focused on violence prevention strategies, mental health, social activism, employment, financial literacy, and more. The conference also includes a youth town hall, talent showcase, scholarships presentation and a Community Builder Awards ceremony. Volunteers throughout the community serve on various committees to make the conference a success. Join us in the fight against violence by becoming a SafeSummit’19 volunteer today! Meets the fourth Tuesday of the month with the exception of December from 1:00 pm – 3:00 pm. All meeting locations are at the Children’s Board of Hillsborough County, Tampa, Florida, unless otherwise specified. THIS SCHEDULE IS SUBJECT TO CHANGE.